A comprehensive review of some of the most popular and best anti snoring mouthpieces, snoring devices and mouth guards to help stop snoring. This review will include many of the popular snore devices and describe how they work to stop snoring. There are different categories of products. Each works in a unique manner to reduce airway resistance and increase air flow through the upper airway. While no product can guarantee that it will work for all people, there is much research demonstrating that many of these categories of snoring devices are effective for many people. In this section, we will review mandibular advancing mouthpieces, tongue stabilizing devices, and other products that have been used for eliminating or reducing snoring. ASA receives a financial benefit from linking to some of these snoring devices. Snoring is simply the sound of resistance and turbulence in the upper airway. Contrary to popular belief, the sound of snoring does not come from the nose. Rather, snoring starts in the back of the airway. Behind the tongue, the oropharynx may become constricted during sleep. What Causes Snoring? About 50% of the population snores. So, chances are, that you are very familiar with the sound of snoring. During sleep, the muscles that keep the upper airway open and patent relax. This is more prominent during REM sleep, or dream sleep, when muscles are most relaxed. As the airway gets smaller, air turbulence increases. The soft tissues in the back of the throat vibrate. This is what causes the snoring sound. Snoring occurs because the soft tissues in the back of the throat vibrate and press against other throat anatomy causing resistance and turbulence – the snore sound. The antisnoring mouth guard or night guard brings the jaw forward which widens the back of the airway, reducing resistance and turbulence – which can stop the snoring. There are several different types of snoring devices which work in different manners. Two of the most popular are Tongue Stabilizing Devices (TSD) and Mandibular Advancing Devices (MAD), also called JAD or jaw advancing device. (MAD’s) – this method is named after the mandible or jaw bone and refers to the effect of moving the jaw slightly forward which results in a greater separation of the vibrating elements in the throats of snorers. You can discover more about the merits and potential downside issues of this type of device here on our Mandibular Advancement Devices research page. Tongue Stabilizing Devices (TSD’s) – this method takes a slightly different approach and seeks to isolate the tongue, pulling the tongue forward and creating a wider gap between the tongue and the back of the throat. You can discover more about the benefits and possible shortfalls of this kind of appliance here on our Tongue Stabilizing Devices research page. Snoring chin straps are also popular products. However, their efficacy is less well established in research literature. As you know, snoring can cause much disruption to the people in your house. It can also be symptom of much more dangerous problem. It is important that you talk to your doctor or primary care provider if you have daytime sleepiness or other symptoms that might be suggestive of health problems. When choosing a snoring device, one of the most important variables is comfort. Are you going to wear the device because it is comfortable. If it is not comfortable, then you are not going to wear it. It will not work if you are not wearing it. Some Tongue Stabilizing Devices (TSD) work by sucking the tongue forward – essentially out of the mouth, or stabilizing the tongue out of the way . My moving the tongue forward, or downward, there is increase open space in the back of the throat. This decrease the amount of tissues that can vibrate in the back of the throat – basically reducing or eliminating snoring. One of the benefits of the TSD compared to other snoring devices is that, generally, they do not cause jaw discomfort. They are less likely to cause TMJ or tooth shifting. For people who have dental issues or missing teeth, the TSD may be a more desirable option. One of the complaints with TSD’s is that sometimes people feel uncomfortable with the position of the tongue. Also, there are several reports of increased salivation (more spit in the mouth). Mandibular Advancing Devices (MAD) essentially work by moving the lower jaw forward which opens up the airway in the back of the throat. Like the TSD, MAD’s also move the tongue forward – along with the entire mandible. The MAD’s used for treating sleep apnea are similar to many of the simple snoring devices listed here. They move the jaw forward. With the MAD in place, the jaw moves forward, the airway becomes larger, and there is less tissue in the flow of air. This yields less turbulence and less snoring. One of the most common complaints with MAD snoring devices is teeth shifting, tooth discomfort and teeth shifting. For people with dental issues, the MAD may not be a suitable candidate. The TSD’s are often a ‘one size fits all’. There are few variables with TSD’s. They are ready to use out of the box. The MAD and MAD-like devices may require extra fitting. Some MAD stop snoring devices can simply be place directly in the mouth and used. Other, more advance snoring mouth guards, use a ‘boil and bite’ feature which allows for the personalization of the device. These Boil and Bite devices allow for custom fitting with your mouth and teeth. Usually the devices are placed in boiling water for several seconds. After cooling the device for a few seconds, the snoring device is placed in the mouth. The user bites down on the formable piece and pushes the soft plastic against the teeth. Once cooled, these snore guards now fit the use, and only that user. That conform directly to the owners mouth. Some of these dental devices can be refitted if the impression is not correct. By simply repeating the process, the device can be refit. Many of these MAD’s are now adjustable for snoring efficacy. Like the professionally made sleep apnea oral appliances, some of the snoring mouthpieces can have protrusion of the lower part of the guard adjusted. Some of these adjustable devices require a tool for adjustment. By turning an allen wrench, the mandibular part of the mouthpiece can move forward or backward. This can allow for fine tuning of device based on efficacy vs. comfort. Generally, the more forward the lower part, the less comfortable, and the more effective. Of course, if the device is not comfortable, the user will not wear it. Most of these devices are made of a thermoplastic. This like a rubbery plastic that has some pliability or flexibility. They feel and look like sports mouth guards. However, sport mouth guards and bruxism mouth devices to not usually move the jaw forward. They work in different ways. One MAD device has a built in tongue stabilizer which reports to bring added efficacy to eliminating snoring. Other devices have a snoring hole, or multiple snoring holes. The cost of snoring devices range from about $30 – $150. Snoring mouthpieces that are made by dentists may cost >$500 – $1000. This depends on the type of device and how often it is used. Most snoring devices are not expected to last for more than 1 year. Some may last for a few years. Keep in mind that with grinding and clenching that the pieces may wear down. What about dentures and snoring devices? Most snoring devices do not work with denture users. The MAD’s require teeth as the ‘anchor’ of the mouth. There needs to be something to grip the mandible so that it can be moved forward. Is a snore mouthpiece the same as a bruxism device or a sports mouth guard? No, snoring devices are different that brux guards and sports mouth guards. They may look similar. They may feel the same. But, they work in different ways. MAD devices do offer some protective value for people who have bruxism or are teeth clenchers. Although MAD’s may prevent the destruction that is caused from bruxism and teeth grinding, it is unclear if they prevent consequences of teeth clenching – like abfractions. Do I need a physician’s prescription or order for these treatments? Some snoring treatments are offered over the counter (OTC). Snoring nose strips, and sprays (not recommended by this author) are offered without a doctor’s order. However, many of the MAD’s offered in the U.S. do require a physician order as they are listed as FDA Class II devices. Do I need a doctor’s order for simple snoring devices? For some snoring devices, you do need a doctor’s prescription. Because many of these devices are regulated by the US FDA, they are considered treatment devices. There is concern that many individuals that have more severe health issues, like obstructive sleep apnea, may be undiagnosed, or misdiagnosed, and have complications as a result of no clinician intervention. In general, it is recommended that you speak with your physician and dentist about using these devices before you use them. What is the difference between an expensive snoring device and less expensive one? One of the most significant differences is adjustable and customization. The more adjustable and personalized, the more complex and expensive. Many of the newer, and more expensive devices avoid latex materials and plastics that contain BPA. Latex has much potential to be allergenic to some individuals. BPA is be actively studies because of the consequences of absorption into the body. Most high quality food containers and medical devices avoid latex and BPA because known and possible risks. Can I use snoring mouthpieces for treating sleep apnea ? Some snoring devices have an FDA indication for treatment of mild obstructive sleep apnea. Unless ordered in conjunction with physician care, you should not use a simple snoring device for the treatment of sleep apnea. One of the risks of using a simple snoring device for the treatment of sleep apnea is that the device will not adequately treat all of the respiratory event during sleep. Essentially the user risks being under-treated. There is an increased risk of heart attack, stroke, deadly heart rhythms, and accidents from daytime sleepiness in patients with untreated obstructive sleep apnea. What about Central Sleep Apnea and Snore Guards? Generally oral devices are not used for the treatment of central sleep apnea. What should I do after getting a snoring device? As mentioned above, it is good practice to talk to you doctor and dentist before starting any treatment. Having good dental care and following dental hygiene is important in maintaining oral health. Once you have the device, you should have follow up with your doctor and dentist. If you have pain or discomfort, this is something that should be discussed. If you have persistent snoring, pauses in breathing, witnessed apneas or gasps, or excessive daytime sleepiness, you may need to be evaluated for sleep apnea. How to maintain and care for my anti snore mouth guard? One of the most important things to do with your mouth guard is to keep it away from animals that like to chew things. Dogs are well known for using snore mouthpieces for chew toys. Keep your device in a protective container away from pets. There are some special cleaning fluids which can be purchased to clean your device. Simply using water with a gentle tooth brush will keep particles off of the device and help to prevent fungus and bacteria from growing on the device. Always defer to your physician and dentist when seeking treatment of snoring or sleep apnea. It is advisable that every user of a snoring devices discuss the treatment plan and have proper evaluation. Often snoring will get worse with weight gain. If you gain 5 or 10 pounds, or more, your device may not be as effective. Losing some weight might certainly improve sleep breathing status. There is much data that shows a correlation between weight and snoring, and weight and sleep apnea. Snoring is also known to get worse with alcohol use. Avoid alcohol 4 hours before sleep. Snoring often is also worse in the supine or back position. Sleeping on your side may help to reduce snoring. As mentioned, snoring could also be a sign of sleep apnea. Learn about treatments for sleep apnea including CPAP Machines & Masks. What are the complications of some of the snoring solutions? With most, if not all, snoring devices that move the jaw forward by anchoring the teeth, there is risk that the teeth will shift from their original position. Because of the traction that is placed on the teeth for 8 hours each night, there is tendency for the teeth to follow the direction of the stress. This can cause teeth and bite alignment issues. The mandible and maxilla often feel misaligned in the morning. This is often most noticeable upon waking. When trying to eat breakfast, the teeth might not feel like they fit together like they did several hours prior. This often improves as the days continue. Similar to most interventions in the medical field, there are risks and potential complications with dental sleep and snoring treatments. Oral Appliances in Obstructive Sleep Apnea. Treating OSA: Current and emerging therapies beyond CPAP. Conclusion: THE BEST ANTI SNORING DEVICE? You have come to this website to find the best anti snoring mouthpiece / stop snoring guard. Each device is slightly different. There are advantages and disadvantages to many of these devices. Often, trying one for comfort and efficacy is required to determine which anti snoring mouthpiece is best for you. 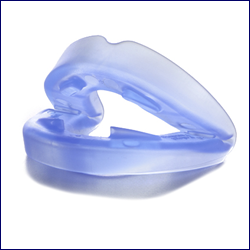 See more about Top Anti Snoring Mouthpieces, snoring device and Mouth Guards Reviews on our other ASA informational pages. The Zyppah is the only one with the tongue strap. Does any one have this snoring device and does the strap keep you from snoring? Yes, Zyppah has the tongue thingy. I would also like to know if you can swallow with it. Does the strap keep you from swallowing? Do not order from Zen Sleep. I bought the device and it was very uncomfortable so I gave it about 4 nights but I was unable to fall asleep with it. I then tried to return it but they make you get an RMA number and they don’t answer there phone or return messages left. They also have an auto response on the email and never send you the RMA number to return the funds. False advertising. Scam company. I have found that the stop snore guards are pretty useful. I have played around with a few of them. The boil and bite devices are certainly more custom and fit your mouth better. I don’t know if they yield a better result, but it seems like they would be more comfortable. IMHO, the colors of some of the snoring mouthpieces are a little off-putting (just make them all clear or white!). You should find one that is adjustable so that you can move the jaw forward and adjust it when you snore. I need a tightening tool for a dental device and the practice that fitted it is closed. This is the small rodlike tool that you put in the holes and turn to adjust the bats that hold the top and bottom together. I’d there a way to purchase one? I don’t see any brand markings. If I mold a mouthpiece to fit my teeth to keep from grinding teeth an biting my tounge, could it also help with my snoring? I am thinking seriously about the oral appliance for sleep apnea. I have moderate apnea and cannot tolerate the CPAP. I am worried about the jaw/teeth alignment after wearing the appliance at night. Is there something that you can wear in the morning that will move the jaw and bite back into place? I wear a mouthpiece to prevent grinding. I have recently started snoring. I do have diagnosed mild sleep apnea also. .I wondered if there is a combination mouthpiece for me? I have a night guard for grinding as well. I suspect any of the ones that look like “mount protectors” (rather than the tongue units) will be more that sufficient to keep you from grinding. The biggest problem over your nite guard is that these are usually thicker and likely to be less confortable than your guard if you have one that a dentist made from a mold. Do you have a device that works with braces? I have been in them for almost 6 years, but I can’t wear the more common devices.